Summer school? Come to Hungary! It’s only spring now, but it’s time to plan your summer already! The summer at Hungarian Universities will be full of life: join one of the universities’ Hungarian language summer schools and have a great summer in Hungary! Alumni Hungary Lecture Series - The first online coaching video is OUT! In the next 3 month we will publish 3 exclusive online coaching videos to support you in your international career development and self-branding endeavour and try to give answers to important questions related to these topics. The Alumni Hungary Communication Handbook is out! Your key handbook towards a successful and efficient communication, which helps you to share your Hungarian experiences, memories and professional achievements with other Alumni Hungary Members and with the Alumni Hungary Team. Alumni Hungary Pakistan is a local chapter of Alumni Hungary. 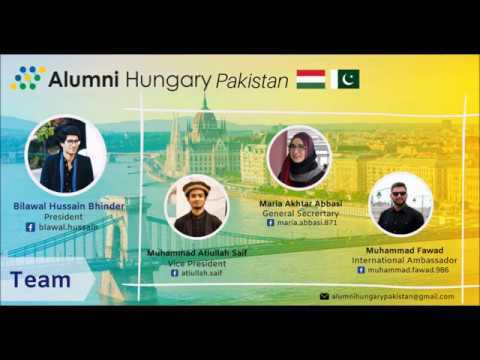 The chapter is established with mutual-cooperation of Alumni Hungary Network and four active Alumni members from Pakistan who recently completed their respective phases of education from different Hungarian higher education institutions.